Fire History In Southeastern B.C. I established my permanent research plots in 1992 and have been monitoring them since then. 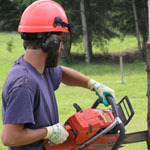 In a recent collaboration with scientists from the US, we have made an alarming discovery… Widespread Increase of Tree Mortality Rates in the Western United States Tree death rates have more than doubled over the last few decades in old-growth forests of the western United States and southwestern British Columbia, and the most probable cause of the worrisome trend is regional warming, according our research published in Science on January 23, 2009. 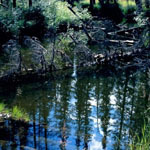 These photographs are of the forests in and around my permanent research plots. Starting in 2007 and continuing today, our lab is exploring coastal forests, using helicopter reconnaissance to identify areas in which dead yellow-cedar are concentrated. 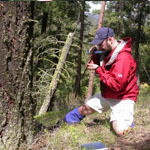 We are collecting tree-ring cores from several hundred yellow-cedar trees in an effort to identify the tree species’ relationship to its climate and assess its vulnerability to changes in snowpack and drought. This gallery looks back at a great summer of field work examining the effects of insect defoliation on coastal hemlock forests. It features commonly used techniques and instuments in dendroecology. 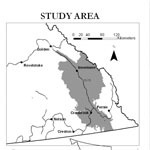 This project examines the drivers of fire in the mixed conifer montane forests of southeastern B.C. 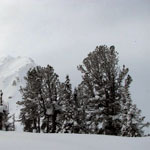 One focus of the research will be on the multicohort stands found within the dry cool Montane Spruce (MSdk) subzone. Our interest is in linking the frequency and severity of fires that resulted in these unique and interesting stand types to drivers. Typically these stands are composed of a mixture of veteran western larch, Douglas-fir, lodgepole pine and spruce. 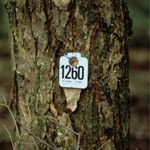 These photos show some of the stands and trees encountered during the field season in 2006. These are photos from my last summer of field work done in the Foothills Model Forest, near Hinton Alberta. It was a seven week odyssey of data collection, mosquitos, chainsaws, and driving an F-350! On some days, by the time we got to site, we just didn’t want to get out of that cushy vehicle . . . but we made it and had a successful field season! Here are a few photographs to show you what we got up to. Featured are me, Sonya Powell (M.Sc. 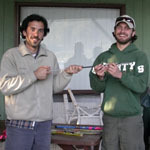 hopeful) and my undergraduate field assistant, Kyle Terry. Enjoy! Over reading week in February 2006, a group of students from Dr. Daniels’ fourth year Vegetation Disturbance and Dynamics course travelled to Vancouver Island. 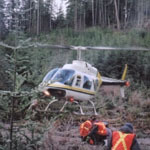 The objective was to lay out research plots in coastal old growth stands that are scheduled to be logged by helicopter. Measurements of existing vegetation and ground cover surrounding the target trees will be used to identify changes to forest floor communities resulting from the openings in the canopy post logging. 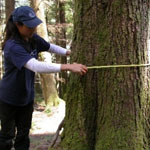 The eventual goal is to determine what is the optimum canopy gap size that will promote the replacement of selectively logged, shade intolerant Douglas firs. Summer 2008 marked a summer of adventures for Eileen Jones, Amy Nicoll, Julia Amerongen Maddison, and Evan Henderson. We returned to the Foothills Model Forest in Hinton, Alberta to check up on our riparian permanent sample plots and collect data for Eileen’s M.Sc. 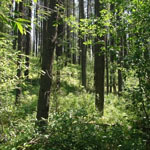 project on coarsewood dynamics in upland old-growth pine and spruce stands. This photo gallery documents the highlights of our summer. Thirteen of us transformed a cabin on Shuswap Lake into a tree-ring laboratory complete with 3 Velmex measuring tables, 10 Microscopes, 11 laptops, 2 frisbees, 1 trivial pursuit board and , of course, Boggle. A few pictures of the people with whom we spent the week. Claudette and Hardy came to us from UNBC in Prince George, Dave teaches at Trinity Western, Mariano is a Student of Forestry at the University of Buenos Aires but is studying at UBC Rory is on an exchange from Lancaster University and the rest of us are working or studying at UBC. Monday morning on Shuswap Lake was beautiful as we headed into Kamloops to meet Andre Arseneault of the B.C. Ministry of Forests. We were taken to our site and began coring trees for the samples that would be processed from start to finish throughout the week. Coring, mounting, drying, sanding, measuring, crossdating, estimating ages and statistical analyses were all the techniques that were taught and practiced by all members of the group. 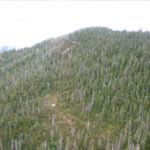 These photos illustrate the impact of western hemlock looper defoliation on coastal BC forests. 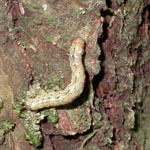 Photos were taken in the summer of 2003 within the Coquitlam watershed.